Simple. Tasty. These are two of my favorite concepts when it comes to cooking. Sometimes less fuss is better. You can make these on the stove or in an electric steamer, but I like to pop my little veggie steamer in the microwave because I usually have the burners busy with other good stuff. I normally slather all vegetable with butter, but a while ago I was in a phase of putting honey in or on everything. I also like to use honey just to get my silly son to say it. When he was yougner, he always called it "heena" instead of honey. So these carrots are sort of inspired by Eric because he likes baby carrots and he loves honey. 1. 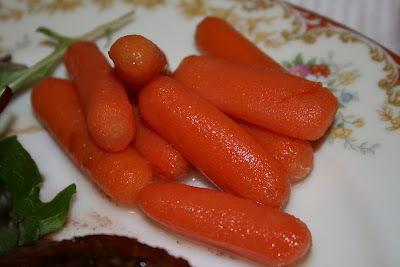 Steam or microwave the carrots to desired doneness. I aim for more cooked than crispy, but not mushy. I usually cook them in the microwave for about 5 minutes with about 1 Tablespoon of water. I have a Pampered Chef Micro-Cooker steamer and it is perfect for this. 2. Drain carrots and while still hot, mix in the butter and honey. 3. Serve! You might like them with a sprinkle of cinnamon or Vanilla Bean Sugar. Thank you so much for posting this! I was in a pinch & have the pampered chef micro-cooker. You just helped me out! Thanks & Be Blessed!